2012 was a memorable year at Marcel's as we cooked, created and celebrated! In 2012, we expanded our COOKing classes with the addition of chefs Jamie, Robin and Lynn who each bring their own expertise to our table. We CREATEd a place where lots of happy gatherings take place, be it in front of a food demonstration, a cooking class, or a friendly place to come in for inspiration or to find that perfect gift. And we CELEBRATEd our first anniversary in grand style. Before we ring out the old year,however, we have to first THANK YOU for helping make Marcel's Shop and Share Thursdays a huge success. Because of your patronage, Marcel's donated over $4000 to the selected non-profit recipients of our Shop and Share Thursdays: Inspiration Kitchen, The Glen Ellyn Food Pantry, Outreach Ministries' Jubilee Village and The First Congregational Church of Glen Ellyn. Thank you all! Now, with the holidays behind us and winter before us, most of us find ourselves with more time spent indoors. 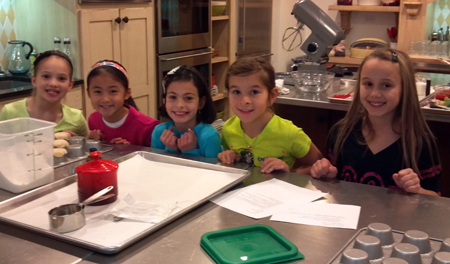 January is a great month to use that time to cook, create and celebrate! New energy, new projects, new recipe, new cooking method....as always, Marcel's has something cooking to help energize your January. DEMOs WITH THE STAFF: Join us on (most) Tuesdays as our friendly staffers demo one of their favorite recipes. Remember, we are just the regular gals, not trained chefs, who just want to share with you a recipe that we like and think you might like as well. Pull up a chair, watch, sample and have some fun with us! Please see the class calendar for menus and dates. INDOOR SIDEWALK SALE: As we have no snow to consider, the only four letter word that seems appropriate for this January is SALE! The Glen Ellyn Downtown Alliance is sponsoring the Indoor Sidewalk Sale at 476 N. Main Street (the former Run Today space)on Friday,January 25 and Saturday, January 26. Come on down the sidewalk to Marcel's to see the large array of lovely sale items we will have for you here at 40% off and more! Dinnerware, glassware, cookware, bakeware, tableware, specialty food -- it's all on sale that weekend! Help us make room for fab spring merchandise and pick up that special item you've had your eye on. Can you say Happy New Year too many times in one newsletter? I hope not! We really are happy here at Marcel's because we just concluded a wonderful holiday season with all of you and we had so much fun. I hope that it is obvious to everyone who comes in here what a great time we have selecting the merchandise, designing and delivering our great cooking classes, making the store look beautiful with just the right touch of whimsy and helping all of our customers find just the right thing for themselves or the lucky gift recipient on their list. We hear over and over again how much all of you enjoy coming into the store and we will work hard to keep that happy spirit alive during 2013! 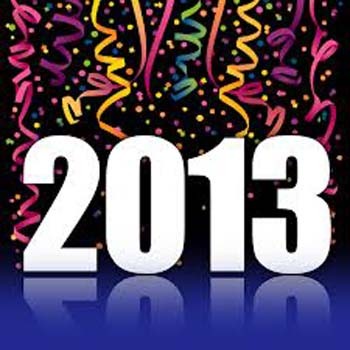 While we celebrate the successes of 2012, we are looking ahead to what's new for this year. Bob and I are going to New York at the end of the month for our first trip to the New York International Gift Fair and I am hoping to find all kinds of unique treasures for you! 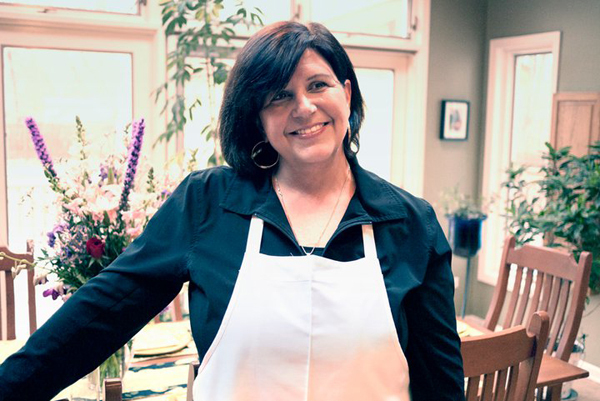 Chef Kelly is cooking up (sorry) new class ideas that will include some field trips and we're going to bring back a couple of our competitions that were so much fun! Also, look for an email in the next couple of days with a link to a survey where you can tell us more about what you think about our classes, whether you have taken one or not. Sometime this year you will find more reasons to visit our website -- recipes, more on-line shopping, and maybe even an "Ask the Chef" feature! So, no resting on our laurels at Marcel's! We're taking our laurels, spiffing them up and giving you all new reasons to make Marcel's your destination for 2013. I received an email the other day and the salutation read, "happy new beginnings." I was instantly uplifted; new beginnings are synonymous with the first page in a new book, the first cup of coffee in the quiet morning, packing the car and heading off to college. The New Year can bring anticipation, resolutions, determination for change, goals, and stress! For some reason, maybe human nature, resolves are more solid, goals loftier, and determination stronger; for a while. Although hopes for 2013 may be to eat less red meat, cook more meals at home, or alter your meal plans, it may not be necessary to resolve to become a vegetarian, never eat out, and ditch your entire repertoire of recipes to cook from Julia Child's cookbook from start to finish. Chances are you may quit before you even begin. Small steps lead to big finishes. Perhaps by inserting a seasonal root vegetable stew on Wednesday nights and a cheesy frittata on Monday your family might not even miss the meat. A crock pot or Dutch oven is a great way to combine the entire meal into one pot, making cooking at home a bit easier during the week. And on each trip to the grocery store, try putting one new item in your cart that you've never cooked with before. Building a dish around it just might yield a new family favorite recipe. The Marcel's shelves are stocked; the cooking classes available, and the retail staff and chefs are available to ensure small steps lead to the big finish! Happy New Beginnings in 2013! Here's a recipe to meet all three goals, meatless, can be made in a Dutch oven or crockpot, and introduces preserved lemons and a short cut to making them! 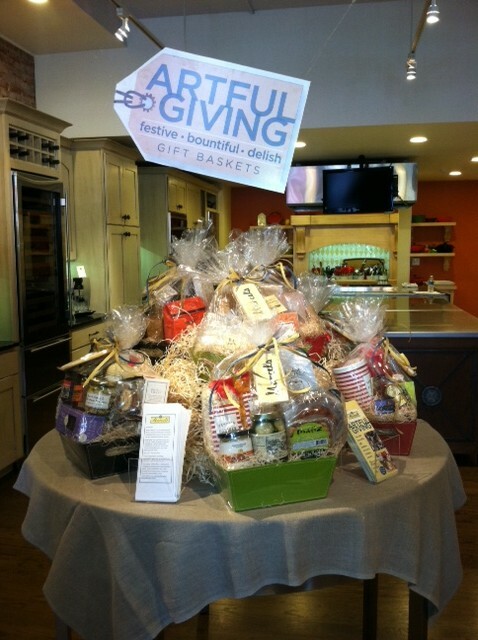 This past holiday season was aflutter with all things gift baskets! Every basket was assembled with love by Marcel's employees and they were shipped from coast to coast. Our holiday offerings included three different themed baskets in three different sizes, full of gourmet sweet and savory items; something for everyone and every budget. We also offered gift basket building for those who wanted to put their personal stamp on their gift giving. A gift basket is a perfect gift for anyone and everyone. Who doesn't love receiving a bundle of delicious fun? So keep us in mind when you need a hostess, get well, sympathy, congratulations, thank you or birthday gift. Our baskets are perfect for every occasion. Throughout the year, we will be designing original, themed baskets thay you won't be able to resist. Call us, shop online or come into the store. We are here to make your gift giving easy and joyful! Happy New Year! Happy New You! THE DISH this month is really THE DRINK. The GREEN Drink! Is one of your resolutions this year to be healthier and eat more fruits and vegetables? Green drinks are the popular choice this year, either by blending up a smoothie in a Vitamix or making a tasty juice in a Hurom juicer. Both are easy and delicious ways to add more fruits and vegetables to your diet. What's the difference? A smoothie is quick to make. Throw everything in the Vitamix and turn it on. You get nutrients and fiber. Making juice allows you to get more nutrients in a single serving than you would with a smoothie because you are able to use more produce. The juice is also absorbed quickly into the bloodstream. It is more of a supplement, not a meal replacement. There is more prep required for the juicer but the benefits are definitely worth it. 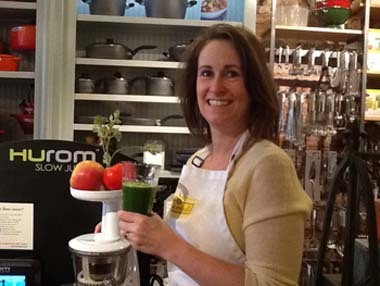 After using two different brands of juicers I had to get the Hurom Slow Juicer once I saw how easy it is to clean. I juice more because I no longer dread the clean up required with my old juicer. There is a great video on the Hurom website that shows how easy it is to use and clean. During the winter I try to juice several times a week. This year with all the terrible flu and viruses that are going around adding a high nutrient juice to your body will help boost your immune system. Making juice is easy. Pick a green vegetable or two, add a fruit, a little citrus and a little ginger or parsley and the possibilities are endless. Make sure you mix up your greens and not just use one or two, like spinach and kale. Juicing allows you to add a wider variety of vegetables to your diet that you may not usually eat and you can also use up any extra produce you have sitting in your vegetable drawer. Enjoy a healthy new you this year! 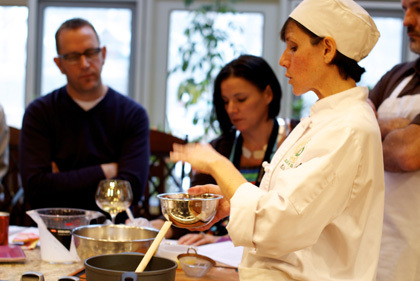 Marcel's cooking classes have something for everyone! Here is just a sample of what our January lineup holds. For complete class details, please see go to www.marcelsculinaryexperience.com or stop in the store for a class calendar. Marcel's has something for your 8 to 12 year olds to do on those two days off from school on Martin Luther King Day weekend! Chef Jamie is teaching the kids how to make the perfect burger with beef, turkey and pork with THE SLIDER BURGER BAR on Monday, Jan 21 from noon to 1:30pm. And on Tuesday, January 22, Chef Jamie is whipping up some traditional campfire foods with the kids including battered fish and s'more cupcakes...YUMMY! Make your reservation now. January is a perfect month to take on breadmaking! Sign up for our SOURDOUGH BREADS WORKSHOP as Chef Coleen takes you from starter to proofing to baked product and finished dishes. This two day workshop runs from 12:30 to 3:00 on Saturday aand Sunday the 19th and 20th. It's not Calgon you need to "take you away", but rather a good start to the day with Lynn and her SPA BREAKFAST class on Friday, January 25. Take the time to pamper yourself on the inside and out. This is a demo class~ so watch, listen, take notes and EAT! 9:30 am- 11:00am. Join Chef Kelly and Trish Ranallo from Le Creuset, as they pair great ingredients with great cookware to get great results. The menu is divine, and all class participants will receive a 20% discount on all Le Creuset items purchased after the class. Sign up for COOKING WITH LE CREUSET on Thursday, January 31. RASA WISE, SALES ASSOCIATE: Homemade pizza is a weekly item on the menu at our house. 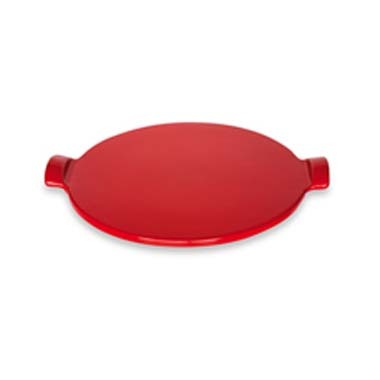 We've been using the Emile Henry grilling/pizza stone for making pizzas on our grill and in our oven. The glazed surface of the stone can withstand up to 750 degrees Fahrenheit and cleans easily. It comes in several beautiful colors. 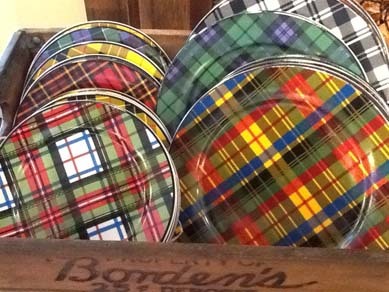 DANA WILLIAMS, RETAIL MANAGER: I fell in love with these preppy plaid plates from Two's Company the minute I saw them! The vibrant colors liven up any table and they marry beautifully with basic white dishes and serve ware. They're available in salad and dinner size and we have a gorgeous platter as well. 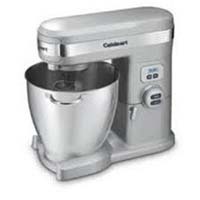 ANNE LAUTZ, SALES ASSOCIATE: My 7 quart 12 speed Cuisinart stand mixer is the true workhouse in our kitchen. The 1000 watts of power, 9 inch deep bowl, tilt back head and the ability to use the 15 minute countdown timer function really delivers the performance I like as I bake double batches of cookies and other tasty treats for our family.